Looking at life with curiosity and being open to new ways of thinking was a key part of Latif Nasser’s speech, which combined scientific ideas with intellectual inquiry. When Nasser started school at Dartmouth College, he was amazed by the amount of information available to him. “I learned that I was curious about a thing I never even knew existed,” Nasser said of attending speeches throughout his college career. Nasser’s speech took place at Radford University on February 21. In his talk, Nasser intended to make science exciting and give students inspiration to take advantage of every experience afforded them at Radford. 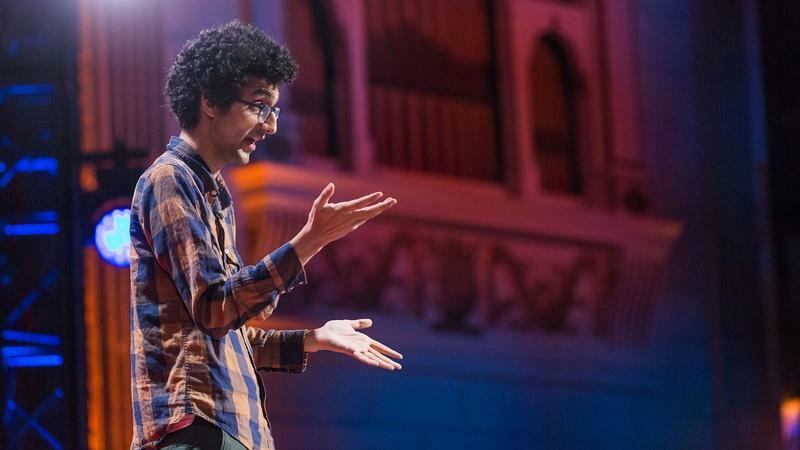 Working as a director at Radiolab, Nasser’s job is to be curious. Telling unusual stories is part of what he does best and in his speech, he shared two stories with two important lessons. The first story detailed the surprising history of the modern-day camel. The animal first appeared in North America and was originally built for surviving cold weather. The camel’s broad feet allowed it to walk over the snow and its hump contained fat to help it get through the 6-month long winter. “Later, [the camel] retrofitted those winter features for a hot desert environment,” Nasser explained. This story proves the value of open-mindedness to ideas. “At any one moment, at any place, you could find one tiny scrap of evidence…that forces you to reframe everything you thought you knew,” he said. The next story Nasser told involved Christina Lee and Freya Harrison, two women who met at an Old English book club, who combined history and microbiology to make a startling discovery: a potion made a thousand years ago meant for curing staph infections worked on modern day bacterial infections. Though the cure has not yet been tested on humans, the women said this discovery shows that bacteria can lose its resistance to certain drugs over time, and in today’s world, when bacteria can quickly grow resistant to new drugs, developing a process of resting a drug and then using it again later could be helpful. This story urges individuals to combine their different interests and “make connections only [they] can make,” as a person never knows what they may find. For a long time, Mars was thought to be a big, red, dusty wasteland floating through outer space. Our previous explorations of the planet have revealed pictures that depicted it as just that, a wasteland. Mars has only been known to have two poles, much like ours, which are covered in ice. However, there seemed to be no sign of liquid water– until now. NASA announced in a press conference on Monday that they have discovered what appears to be flowing, liquid water on the planet. It’s been thought that mars could have had oceans and lakes ions ago, but scientists thought that the planet may be too cold to have liquid water on it now. Five years ago, NASA scientists noticed some dark streaks that appeared during the warmer months, and disappeared in colder months. Scientists have been observing these streaks since, but assumed the streaks could be dust or small landslides. Studying the different kinds of minerals and elements on the planet, scientists realized something had to have been moistening these minerals in order for them to flow the way they have been. “The amount of water could be huge: the scientists estimated that one dark line contains, at a minimum, enough water to fill 40 of the enormous swimming pools used for international competitions,” according to USA Today. The issue with this liquid is that the dust on mars absorbs it so quickly, it’s more of a sludgy landslide than a flowing river as many people are misunderstanding. The water is also thought to be many times more salty than our own oceans water. Scientists remain optimistic about the discovery, however. “Water is the elixir of life,” Mars expert Ray Arvidson of Washington University in St. Louis told USA Today. In other words, this discovery is a huge step towards discovering some kind of life on Mars. This also means that there’s a great possibility that humans could populate Mars, in the very distant future. Although it may be decades or even centuries before we colonize Mars, the possibility is much greater than it was before this discovery. This discovery comes at an inconvenient time, as Hollywood is preparing to premiere a Mars-based movie featuring Matt Damon. The Martian, which is based on a book by Andy Weir, is about an astronaut, Watney, who finds himself stranded on Mars. Watney is left to his own devices to find a way to grow his own food until he can be rescued. NASA’s discovery of water on Mars sort of spoils the plot of the movie, because Mars is supposed to be a dry, arid wasteland.